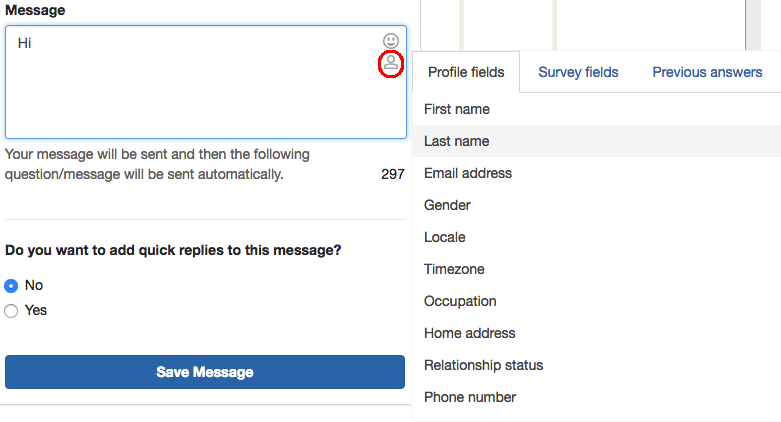 Surveybot is excited to unveil a new feature: updated merge fields! Merge fields are a tool that allow you to input fields with information gathered about your respondents such as their name, their current progress in a survey or their answers from previous questions. This can be a nice way to add a more personal touch to your surveys. It allows your audience to feel more invested and involved. These will autofill with data collected from your respondents’ profiles. If this data does not exist for a certain respondent, you can also create a fallback. This will appear where the merge field data would have. For instance, if you wanted to use a welcome message saying ‘Hi’ and then someone’s first name, but this did not exist. In this case, you could create a fallback saying ‘there’, so that instead of saying ‘Hi Cody’, the welcome message would just say ‘Hi there’. There are more options than just the profile fields shown above, too! You can add survey fields, which can show a respondent’s progress on a survey or quiz. An example of this is the ‘Quiz questions’ field, where you can show respondents how many quiz questions they’ve answered correctly out of the total questions. Finally, there’s even a merge field where you can refer back to someone’s previous multiple choice answer! This will look something like the image below. This feature is great as it allows you to add a very personal feel to your survey! Also, it helps to make your audience feel less like they’re chatting with a piece of software.